A vast 86 percent of Americans support a right to residency for Dreamers. A vast 86 percent of Americans support a right to residency for undocumented immigrants who arrived in the United States as children, with support crossing the political spectrum. Two-thirds back a deal to enact such legislation in tandem with higher funding for border control. Possibly in light of President Donald Trump’s decision to phase out the Deferred Action for Childhood Arrivals program, disapproval of his handling of immigration overall reaches 62 percent in this ABC News/Washington Post poll. Just 35 percent approve. Additional hurdles for Trump are his demand for a wall on the U.S. border with Mexico -- again 62 percent oppose it -- and substantial concerns about his immigration enforcement policies. Americans were asked whether they support “a program that allows undocumented immigrants to stay in the United States if they arrived here as a child, completed high school or military service and have not been convicted of a serious crime,” all elements of DACA, established by Barack Obama by executive order in 2012. Support spans demographic groups, including three-quarters of Republicans and conservatives, 86 and 87 percent of independents and moderates, and 97 and 96 percent of Democrats and liberals. Support reaches 94 percent among Hispanics, 93 percent among blacks and 84 percent among whites. Strong support, 87 percent among Hispanics and 85 percent among blacks, declines among whites to 61 percent. Trump early this month said he would rescind DACA, giving Congress a six-month window to act before nearly 800,000 undocumented immigrants lose protection from deportation. He later reached a tentative agreement with top congressional Democrats for DACA legislation accompanied by upgraded border security. As noted, 65 percent support that potential compromise -- a bipartisan result, with 76 percent support among Republicans, 66 percent among independents and 59 percent among Democrats. Similarly, 71 percent of moderates, 66 percent of conservatives and 56 percent of liberals back the deal. Just 27 percent of Americans in this poll, produced for ABC News by Langer Research Associates, are opposed. Just 30 percent of Americans say Trump has immigration enforcement “about right,” compared with the 44 percent who say this was so before he took office. Nearly half (45 percent) say immigration enforcement under Trump is “too tough,” much higher than the 6 percent who say this was the case before he took office. That said, 49 percent say enforcement was “not tough enough” before Trump took office; just 22 percent say so now. Matching the number who disapprove of Trump’s handling of immigration overall, 62 percent oppose his promise to build a wall along the Mexican border; this has held steady since Trump first proposed it. 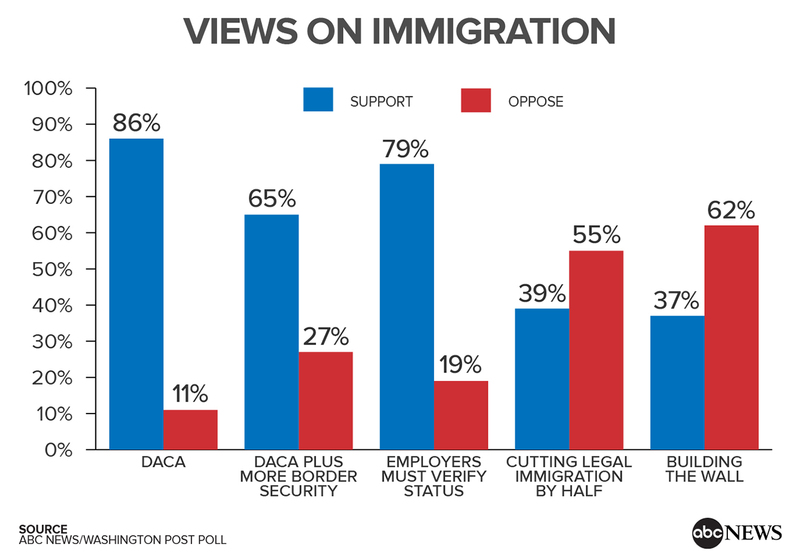 Fifty-five percent also oppose cutting legal immigration by half, another proposal backed by Trump. In contrast, 79 percent support requiring employers to verify that new hires are here legally – a current requirement, with stricter enforcement on the table. In a general measure of suspicion, just 12 percent of Americans think undocumented immigrants commit more violent crimes than other people in the country. The vast majority instead say they commit violent crimes at either an equal or lesser rate than U.S. citizens (64 percent and 19 percent, respectively). Approval of Trump’s handling of immigration is stronger among those who think undocumented immigrants commit more violent crimes than U.S. citizens (78 percent); it drops to 33 percent among those who think crime rates are the same, and 12 percent among those who think they’re lower among undocumented immigrants. Views on Trump’s handling of immigration are highly partisan. Three-quarters of Republicans and 61 percent of conservatives approve, vs. a third of independents and moderates, 10 percent of Democrats and 8 percent of liberals. Differences also emerge by demographic groups. Forty-three percent of men approve, vs. 28 percent of women. Americans over age 40 are more apt than younger adults to approve, 42 vs. 24 percent among those younger than 40. And while 46 percent of whites approve, this drops to 13 percent among both blacks and Hispanics alike.